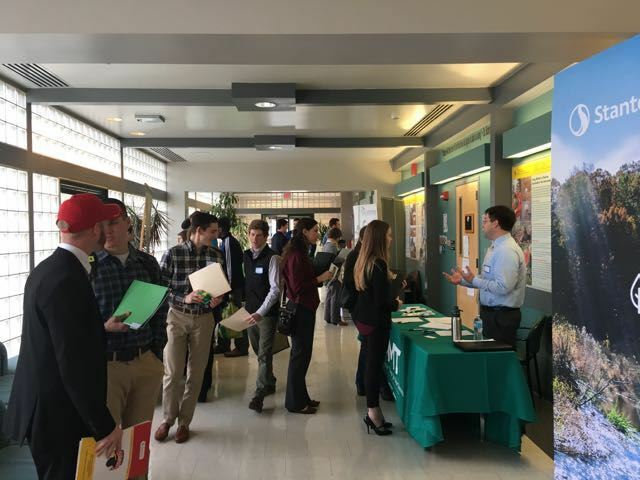 Thank you for all those who attended the 2019 MSRA Stream Restoration Seminar and Job Fair on March 2, 2019 at the University of Maryland. Students from 15 different universities and colleges attended the event. The Morning Seminar focused on introducing students to the Stream Restoration Industry by providing speakers who come from different technical and professional backgrounds. Talks also taught students what training opportunities are available to them, as well as discussing the specific career opportunities that are available. Following the seminar, students participated in the Job Fair portion of the agenda. There were 14 prospective employers in attendance, and once again the immediate feedback from the employers in attendance was how impressed they were with all the students! Thanks to Peter May and the University of Maryland Environmental Science & Technology Department for hosting the event! And another thank you to Mike Galvin, Martha McCauley, Mitch Keiler, Jeremy Payne, Tommy Carney, Peter May and Shannon Lucas for presenting! 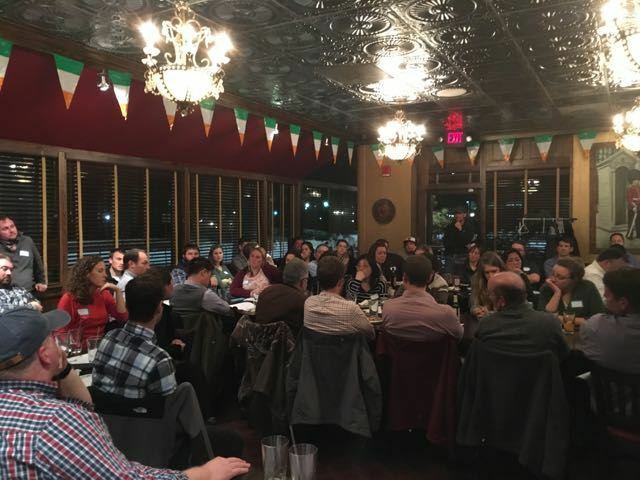 The MSRA Winter Meeting had a record turnout, more than 100 stream enthusiasts attended the January 22, 2019 event at Ellicott Mills Brewing Company! Mark Richmond (Howard County Stormwater Management Division Chief) delivered an engaging and informational presentation about the Ellicott City floods of 2016 and 2018, and the efforts to rebuild. Katrina Emery (EQR Senior Estimator) and Scott McGill (Ecotone co-founder and CEO) presented insight into how the extreme rain events in 2018 impacted stream restoration construction, as well as design and construction elements that were successful (or not so successful) at withstanding record rainfall. Thank you very much to our presenters, attendees, and the Brewing Company. MSRA’s fall field trip to First Mine Run was a huge success. The First Mine Run Farm and Ecotone hosted more than 50 MSRA enthusiasts on a cold blustery November day. The group walked the two Ecotone design build-projects while Scott McGill and other Ecotone employees explained the design and construction of these innovative restoration projects. Then we enjoyed beer and bar-b-que in the club house! Thanks to all the project partners including those who spoke to provide insight into on the award winning Broad Creek restoration project: Jens Geratz with Anne Arundel County, Austin Byers of Century, Jennifer Carr with the South River Federation, and Kirk Mantay now with the GreenTrust Alliance. More than 40 attendees walked through the hot sticky humid air upstream through the restored valley, beautiful native landscaping, and pocket wetlands. It was a great opportunity to see an innovative restoration approach to a highly urban stream corridor first hand and have the opportunity to ask the parties involved questions about the funding, design, construction, monitoring, etc. 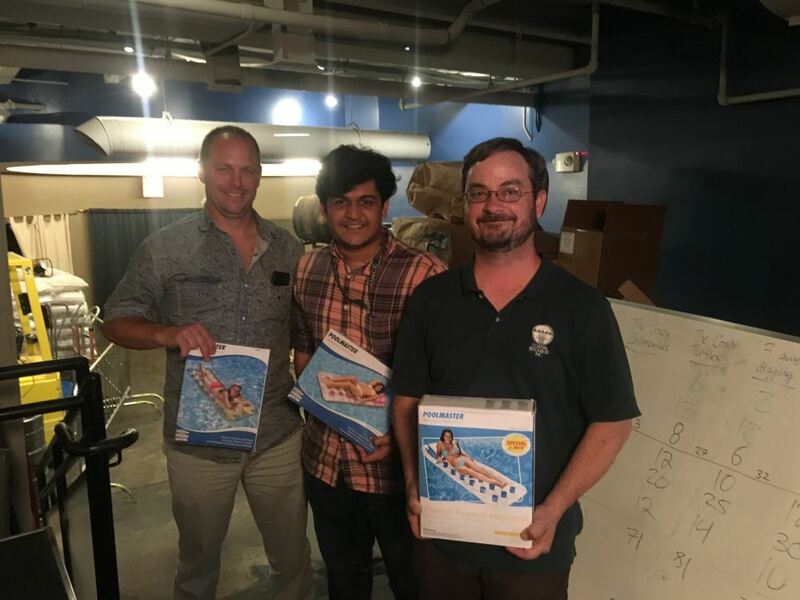 Stream enthusiasts gathered at Little Havana in Baltimore, to strut their trivia stuff at the 4th Annual MSRA Stream Trivia Night on Tuesday, June 19, 2018. The three teams, ‘Rio de Havana’, ‘Yucca Cerveza’, and the ‘Ingenieros’ had a fierce competition, with the scores neck and neck for the entire evening. But Rio de Havana pulled ahead in the last round for a 5-point win, marking the second year that Joe Arrowsmith was on a winning team! Alycia Roberson of EQR took home the Trout Trophy, and will proudly hold it at the office until it is up for grabs again…next year. Dr. Tess Thompson, associate professor in Biological Systems Engineering at Virginia Tech, gave a presentation about her ongoing research, Predicting Erosion Rates of Cohesive Stream Banks. Elections were held. Congratulations to our newly elected officers Mike Galvin (Secretary) and Mitch Keiler (President Elect)! Dr. Thompson's presentation can be found here. 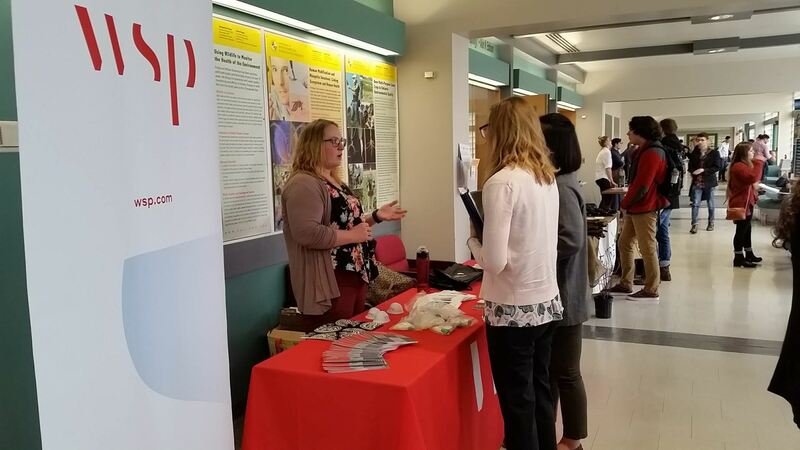 On March 10, 2018, the MSRA held the Spring 2018 Stream Restoration Seminar and Job Fair at the University of Maryland College Park. Over 50 students from more than 12 universities attended and participated in the event. A special thanks goes to the volunteer speakers Mike Galvin, Kathryn Cerny-Chipman, Mitch Keiler, Jeremy Payne, Liam O’Meara, Peter May, Josh Ford and Shannon Lucas, as well as representatives from the following companies: JMT, KCI, EQR, EPR, RES, McCormick Taylor, Empire Landscaping, MDE, Straughan Environmental, Ecotone, Biohabitats, Stormwater Maintenance and EA. 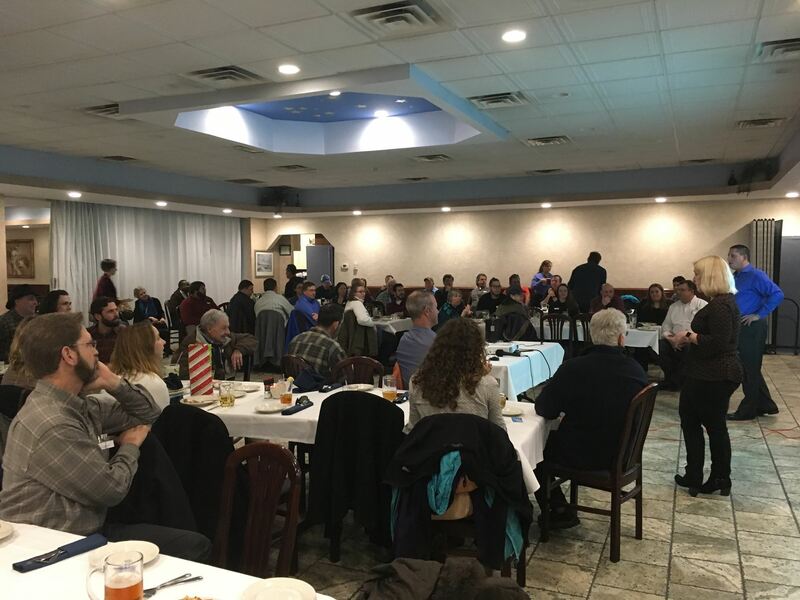 The Maryland Stream Restoration Association held the first quarterly meeting of the year on Thursday, February 8th, 2018 at Hellas Restaurant in Millersville, MD. The meeting kicked off with a review of what MSRA had planned for 2018. Then, MDE offered a brief update on the draft MS4 permits. Finally, Dr. Andrew Muller and Capt. Diana Muller presented about the State of the Severn River. The presentation included the physical and biogeochemical processes that effect ecosystem health of small tributaries of the Chesapeake Bay. Scale effects and the relative importance of creeks vs. the main Chesapeake Bay were also be discussed, as well as potential new tools to measure restoration effectiveness. More than 50 folks showed up on a beautiful sunny fall afternoon on October 25, 2017 for the field trip to Baltimore County’s Kelly Branch Restoration. Austin Byers of Century Engineering and Jake Ayers of EQR led the group along the downstream portion of the project discussing design approach and sequencing. In the evening students and employers came together at the Student Night / Job Fair hosted by Towson University at the Auburn House (Thanks to Dr. Chris Salice of TU!). Austin and Jake gave a presentation on the Kelly Branch project providing insight to the project as well as the general stream design process. Then Shannon Lucas from KCI provided an overview of various career pathways. Thanks to guest speakers: Mitch Keiler (USACE), Jeff White (MDE), Heather McGee (Baltimore County), and Lauren Anderson (RES), who spoke to the students about their backgrounds and careers. Following the presentations, the students networked with potential employers including: EQR, JMT, Ecotone, Inc., McCormick Taylor, KCI, Gannett Fleming, RK&K Engineers, Wetland Studies & Solutions, Inc., and Baltimore County. And very special thanks to Mike Galvin and the Education Committee for making this happen! On Saturday, February 18th 2017, the Maryland Stream Restoration (MSRA) Education Committee hosted the “MSRA Spring 2017 Stream Restoration Seminar & Job Fair” at the University of Maryland College Park, Department of Environmental Science and Technology. 83 students in attendance from over 10 universities were introduced to the Stream Restoration Industry in the State of Maryland by a diverse group of professionals from different educational backgrounds and learned about the various career pathways that are available. 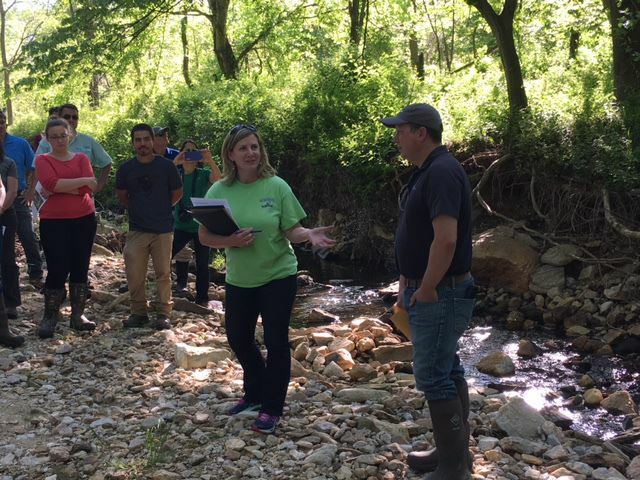 With the implementation of the Chesapeake Bay TMDL, the stream restoration industry has been hard at work planning, assessing, designing, constructing and monitoring projects to restore our streams and watersheds. This seminar was intended to express to the students the need that exists for smart, trained and technically-able college graduates across the industry. After the seminar was finished, the students participated in a job fair with Maryland employers who are currently hiring in the various fields. A special thank you goes to all the volunteers who gave up their Saturdaymorning to either speak to the students or to represent their respective organizations in the Job Fair. The speakers included: Mike Galvin, Scott Lowe, Sarah Koser, Jai Cole, Jim Morris, Alycia Roberson, Joe Berg, Jeremy Koser and Peter May. The Organizations participating in the Job Fair included: AMT Engineering, Angler Environmental, Biohabitats, EA Engineering, Ecotone, Ecosystem Planning and Restoration (EPR), Environmental Quality Resources (EQR), Johnson Mirmiran & Thompson (JMT), Maryland Department of the Environment (MDE), McCormick Taylor, Stormwater Maintenance and Straughan Environmental. 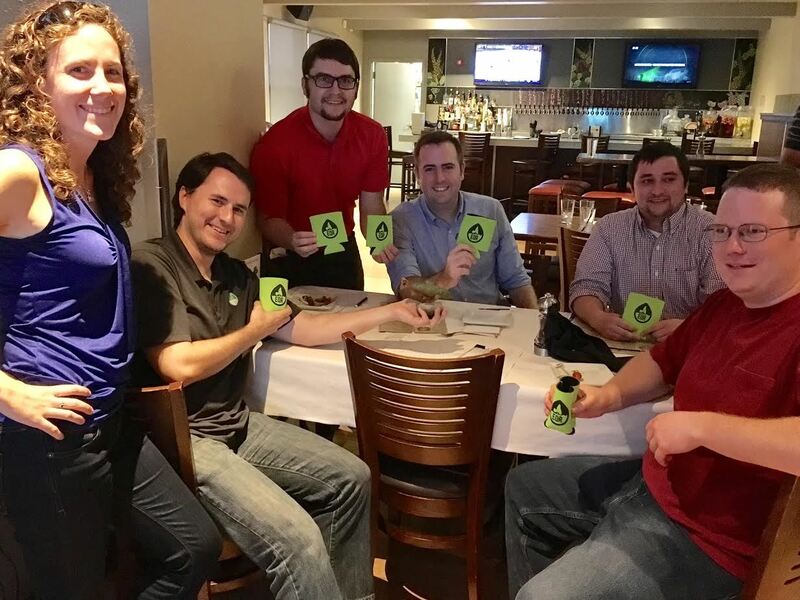 The 3rd Annual MSRA Trivia Night brought 20 plus competitive stream professionals out to Columbia Alehouse Monday night June 12, 2017. 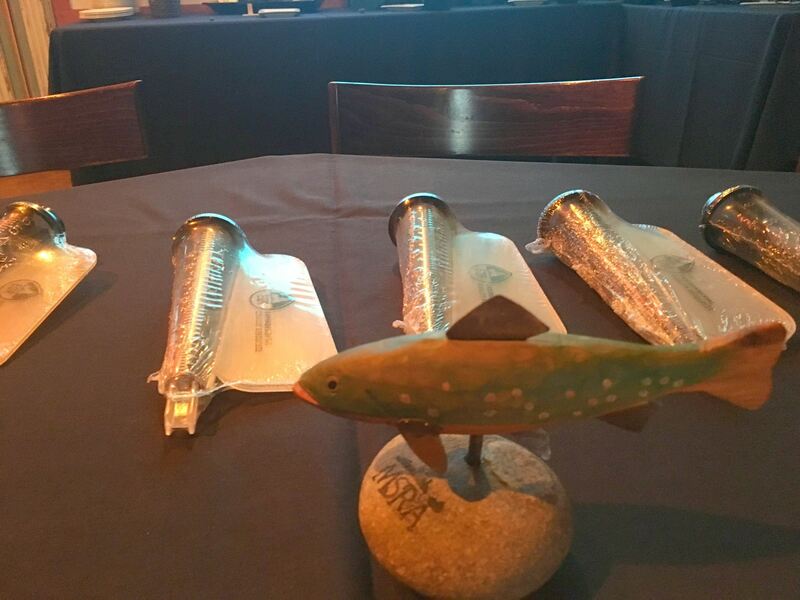 Four teams competed for the bragging rights and the coveted Trout Cup: Stream Team, Creek Freaks, The Gomphidaes, and Executive Power. Katrina Emery prepared the questions and emceed the event, so of course there was an estimating bonus round! 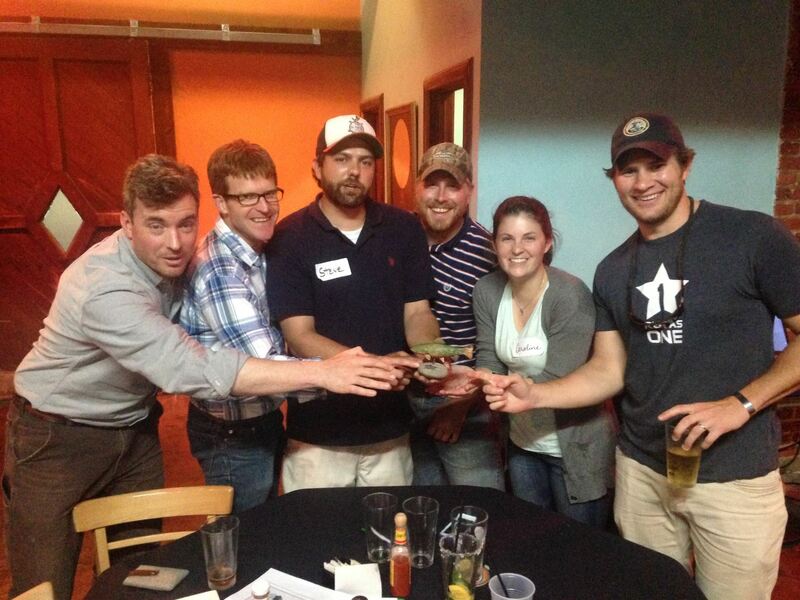 It was close, but the Gomphidaes Team came out on top and took home the historic Trout Trophy. Thanks to all those who participated and helped to organize the event! There was a fantastic turnout for the MSRA Spring Field Trip to the Davis Branch Restoration Site on Tuesday, May 16th, 2017! Representatives from Biohabitats, Ecotone, and the Howard County Conservancy provided background and information on the design approach and construction implementation. 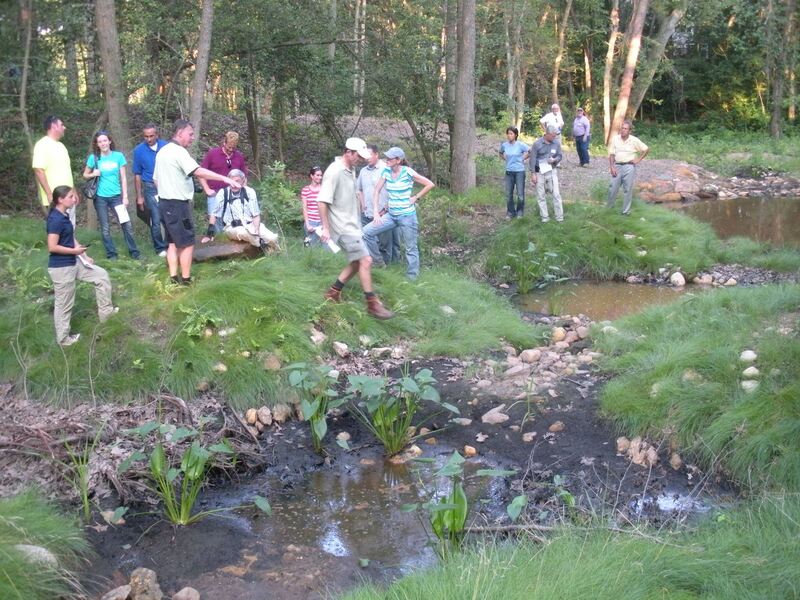 The large group walked upstream to observe the recently constructed project. After the presentation, the group gathered for appetizers and refreshments at Bare Bones Grill in Ellicott City. Dr. Theresa “Tess” Thompson, who is an associate professor in Biological Systems Engineering at Virginia Tech spoke at our spring meeting on Wednesday, March 15, 2017. Her talk was about improving the success of in-stream structures. The Maryland Stream Restoration Association held our Annual Summer Field Trip on August 16, 2016 at the Smithsonian Environmental Research Center (SERC). Tom Jordan gave a presentation on the recently completed SERC Muddy Creek Stream and Wetland Restoration Project. Mr. Jordan discussed the pre- and post-restoration monitoring efforts being conducted in collaboration with USFWS, DNR, and SERC. 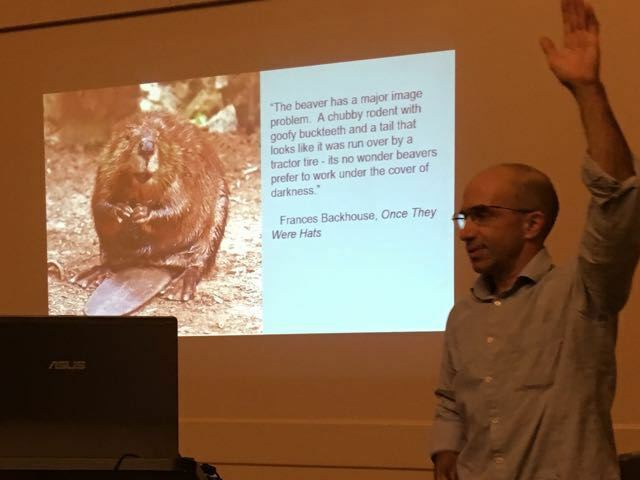 Scott McGill from Ecotone gave a presentation about Beavers / utilizing ecosystem services at our Holiday Party on January 5, 2017. The party was be held at: Kings Contrivance Community Center in Columbia, MD 21046. We had a record number of attendees at over 60 people! It was great to see old and new faces and learn about how beavers are being utilized in the west to restore ecosystems and reconnect streams with their floodplains. The Maryland Stream Restoration Association held our annual Fall Field Trip on November 10th, 2016 at the Jones Falls Stream. This is an exciting project that will allow fish passage and vastly improve that stretch of the Jones Falls. Carl Simon gave a presentation on the recently completed Jones Falls Stream Restoration Project. Mr. Simon also discussed the pre- and post-restoration monitoring efforts being conducted. Representatives from Brightwater, Inc. (designer) and Environmental Quality Resources, LLC (contractor) presented about the goals of the design, permitting, and construction of the project. Our Spring Meeting was a huge success. It was held at Little Havana’s in Baltimore, MD on Wednesday, April 20, 2016. The meeting started with elections and discussion of proposed modifications to the constitution and bylaws. Shannon Lucas was elected as President Elect and Jeremy Koser was elected as Secretary. 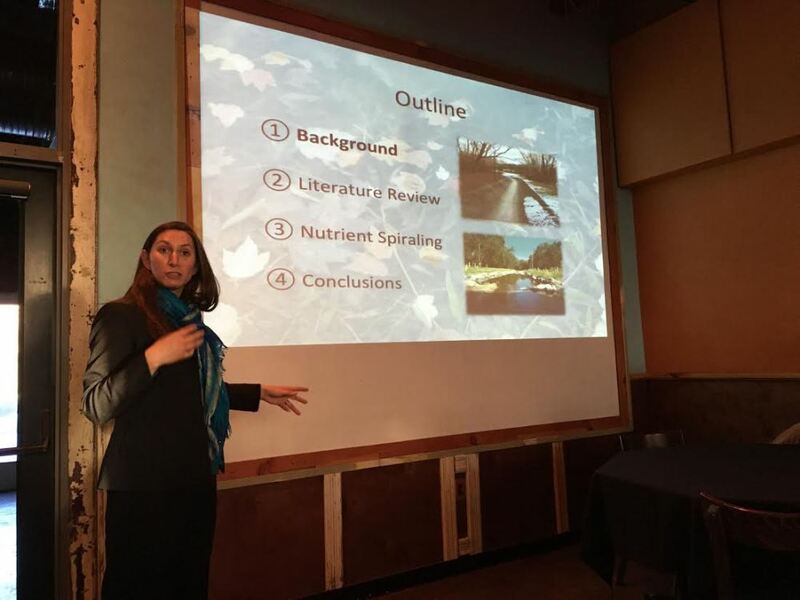 Our guest speaker, Dr. Tammy Newcomer-Johnson of the US Environmental Protection Agency, Oceans and Coastal Protection Division, discussed her recently published article “Nutrient Retention in Restored Streams and Rivers: A Global Review and Synthesis.” The presentation was informative and engaging. Dr. Newcomer-Johnson explained her methods and findings. Her study concludes that certain types of stream restoration projects have a positive impact on reducing nutrients. Dr. Newcomer-Johnson also customized her presentation to offer data focused on Maryland stream restoration studies. The presentation was followed by a group discussion that focused on the need for additional data and monitoring. 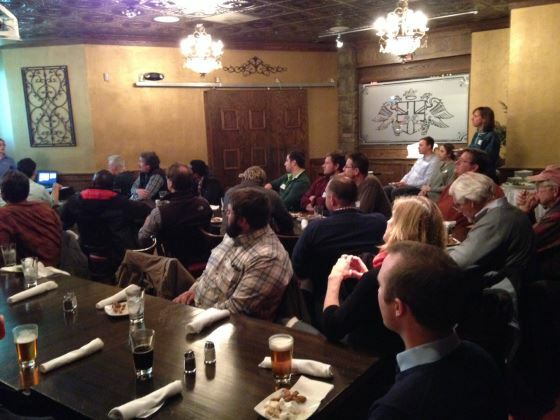 Maryland Stream Restoration Association held the Holiday Party and First Quarterly Meeting on Wednesday, January 13, 2016 at Union Jack’s Columbia. The Featured Speaker was Corinne Stephens from the Alliance for the Chesapeake Bay, presenting about the Alliance’s Businesses for the Bay (B4B) partnership. Also, Scott Macomber, president of the Maryland Stream Restoration Association presented updates from the organization. 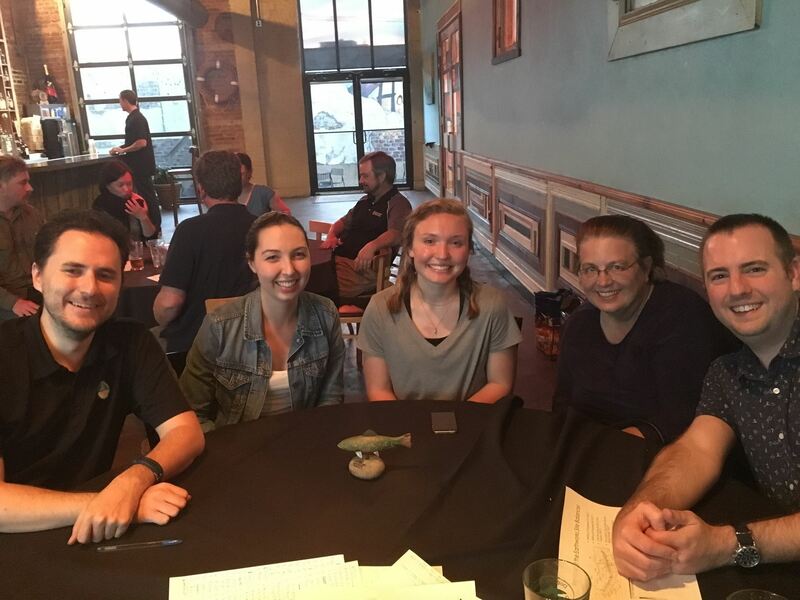 MSRA held its 2nd Annual Stream Trivia night at Denizens Brewing Company in Silver Spring, MD on June 27, 2016. Katrina Emery and Brent Levy organized the event. MSRA provided pulled pork sandwiches, mac & cheese, and a salad. Denizen’s had lots of great beverage choices to choose from including a mead. Teams of 3-4 competed for the coveted bragging rights and prizes. Questions included: biology, ecology, geomorphology, hydrology, stream restoration, and stream construction. Questions ranged from Maryland based to universe based. Did you know that the planet Mars shows evidence of stream erosion? Everyone learned a little something about a subject they weren’t familiar with and Katrina gave everyone a lesson on how to calculate a cut/fill construction estimate. This year’s competition came down to a tie-breaker question. Fun was had by all! 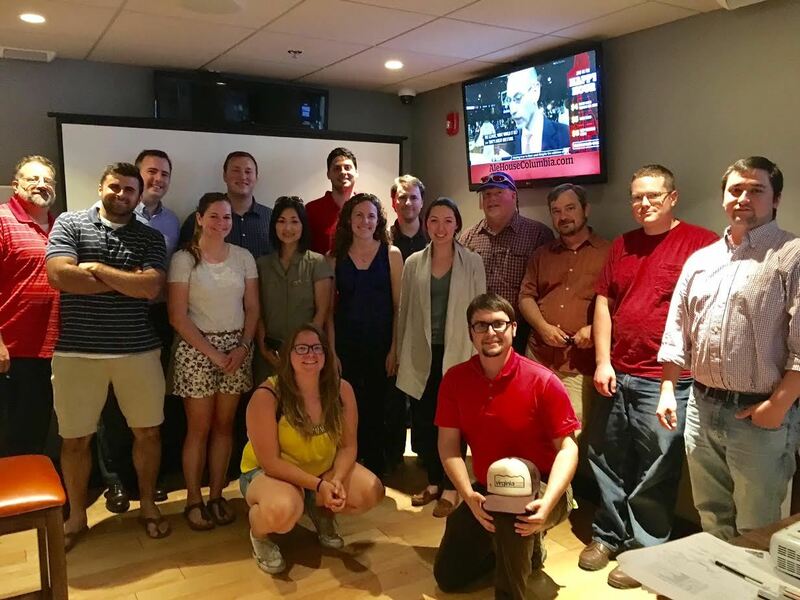 Thanks to everyone who came out to MSRA’s 1st Stream Trivia Night on May 27, 2015. It was a lot of fun and I think everyone learned a little more about the Chesapeake Bay and stream restoration. Special thanks to Katrina Emery for putting it all together and Mike Trumbauer for making the wonderful 1st place prize. This year, MSRA’s Summer Field Trip was on July 15, 2015 to Whitemarsh Run. Jim Gracie took us around his stream restoration site in a section of Whitemarsh Run from Honeygo Blvd downstream to Philadelphia Road which was built in 1995. This stream reach, of more than one mile in length and more than 21 acres of constructed wetlands, is nearly twenty years old. The field trip gave us a chance to evaluate how it has held up. Afterwards we adjourned to Flameworks BBQ for drinks and food. 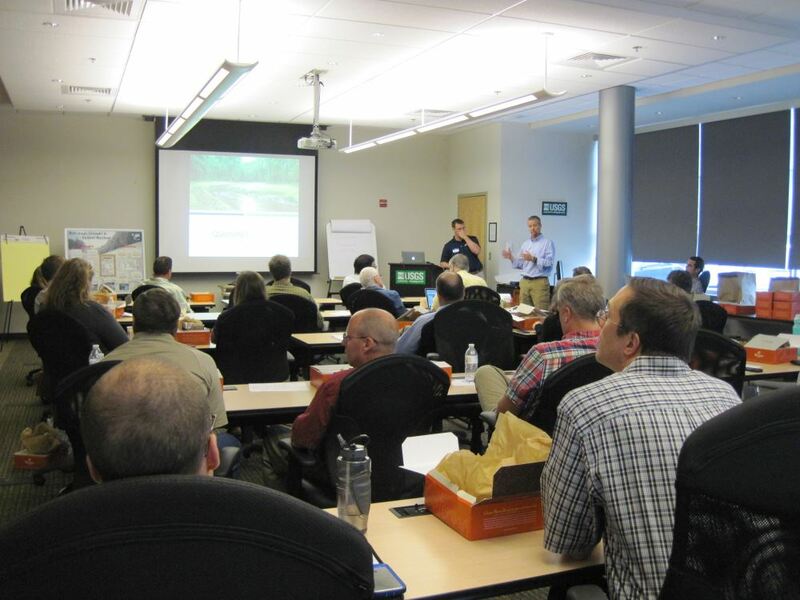 On August 20, 2015, the Maryland Stream Restoration (MSRA) held the 2015 MSRA Academic Forum at the USGS Water Science Center on the Campus of UMBC. The intent of the forum was to engage Educators, Researchers, Resource Agency Managers and Practitioners in an open dialogue to discuss current academic training pathways for students and how they align with future employer expectations, explore Course Curricula related to Stream Restoration and supporting sciences and/or technologies, and to discuss potential careers in the Stream Restoration Field and what are the most desirable skill sets needed for current and future employees. In addition, the MSRA hoped to improve communication and explore potential opportunities for increased cooperation between the various professions. The Field Trip was held on October 1, 2015 at the Upper Little Patuxent River Stream Restoration site on Carrigan Drive in Ellicott City, MD 21042. 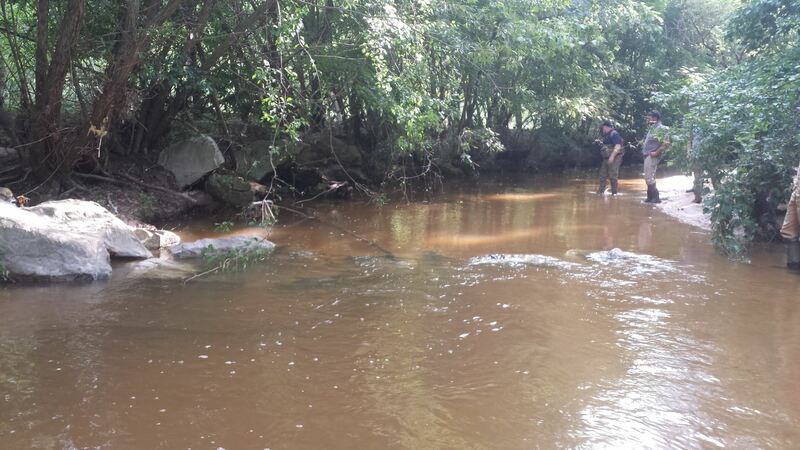 The Upper Little Patuxent River Stream Restoration project represented MSHA’s first-ever design-build (DB) stream restoration to specifically address the Chesapeake Bay Total Daily Maximum Load (TMDL). The project restored approximately 3,200 feet of the main stem and 600 feet of an unnamed tributary. 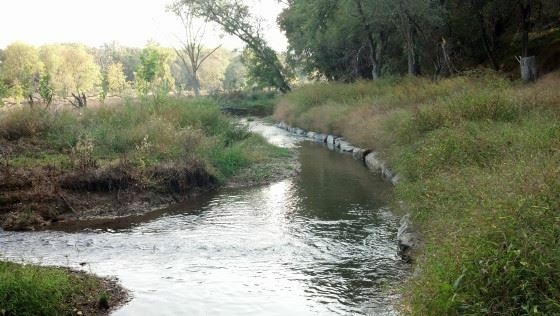 The project provided a cost effective and stable solution utilizing stream and floodplain restoration to meet NPDES, MS4 and TMDL reductions for total nitrogen (TN), total phosphorus, and sediment (TSS). JMT was the lead designer for the Ecotone / JMT DB Team. We had 40 attendees. Following the field trip, we convened at the Stained Glass Pub in Elkridge for drinks and appetizers. 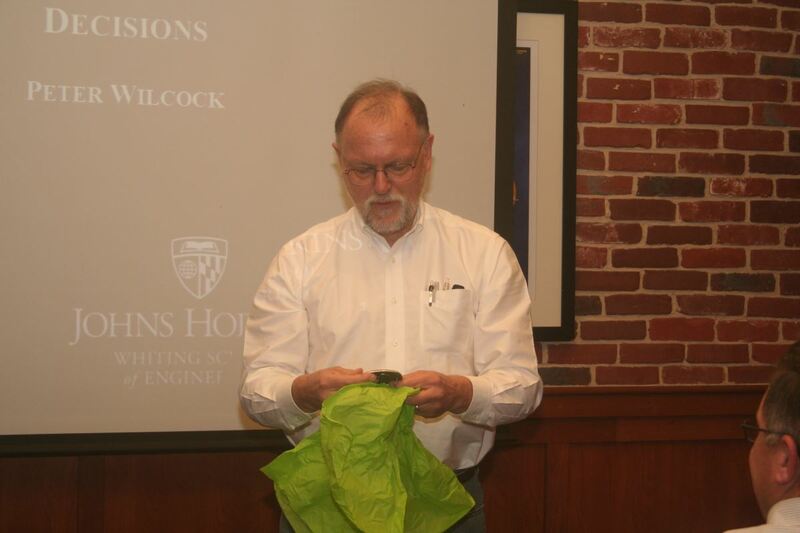 The March 5, 2014 meeting consisted of the annual election of officers, legislative Update, and a talk with our guest speaker Peter Wilcock of Johns Hopkins University, addressing how stream restoration decisions are made. Peter is moving out west and Scott Lowe, MSRA president, presented Peter with some parting gifts. Appetizers were provided by MSRA and attendance was 40+ members. Scott Macomber and Shannon Lucas were elected as President Elect and Secretary. We had over 40 participants at MSRA’s Summer Field Trip on July 23, 2014. 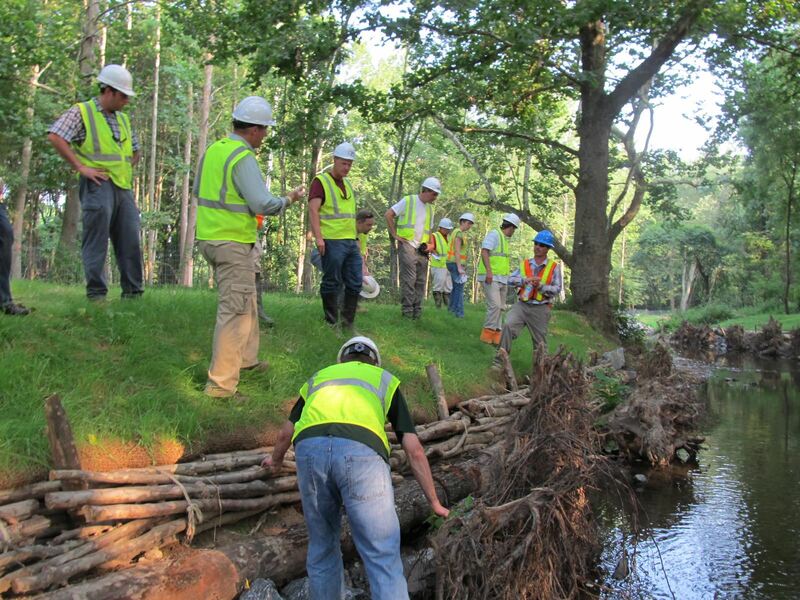 The event was held at the Scotts Level Branch Stream Restoration Site In Baltimore County in Randallstown, MD. Special thanks to EQR, Baltimore County, and EA for hosting the event. Afterwards, we met at Don Pablo’s for drinks and appetizers. On October 1, 2014 we toured the ICC mitigation site SC-19. The site tour was provided by Matt Hubbard who was the designer of the project site. The site was located south of Watkins Drive and North of Deanna Drive on MD 124. Afterwards we met at GrillMarX Steakhouse for drinks and free appetizers. Thanks to everyone who came out to see this great site! 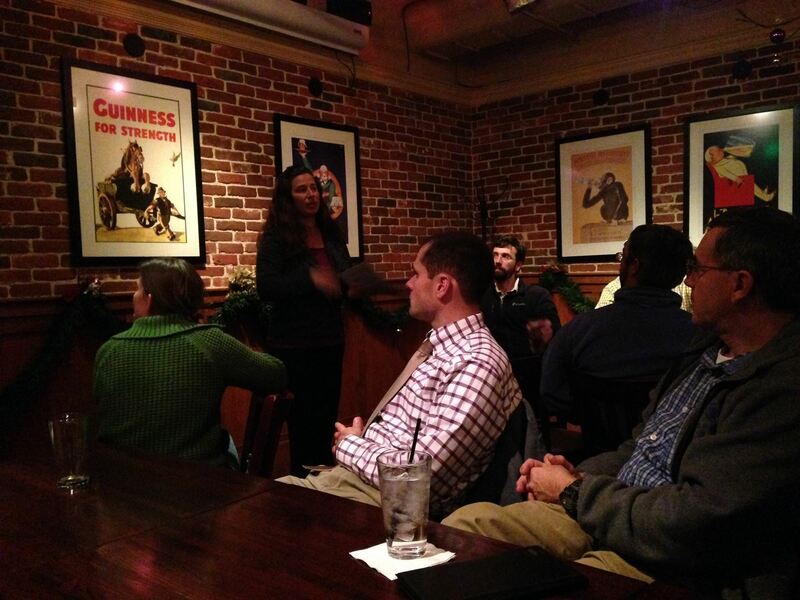 Our Holiday Party and 4th Quarter Meeting was on Tuesday, December 2, 2014 at Nottingham’s Tavern in Columbia, MD. Our Featured Speaker was Dr. Jana Davis from the Chesapeake Bay Trust presenting “Expanding the Power of Restoration Monitoring: One Model for Transforming Monitoring into Replicable Research”. The talk gave a preview of the upcoming Chesapeake Bay Fund Restoration Research Grant Program and included a discussion and question and answer forum. 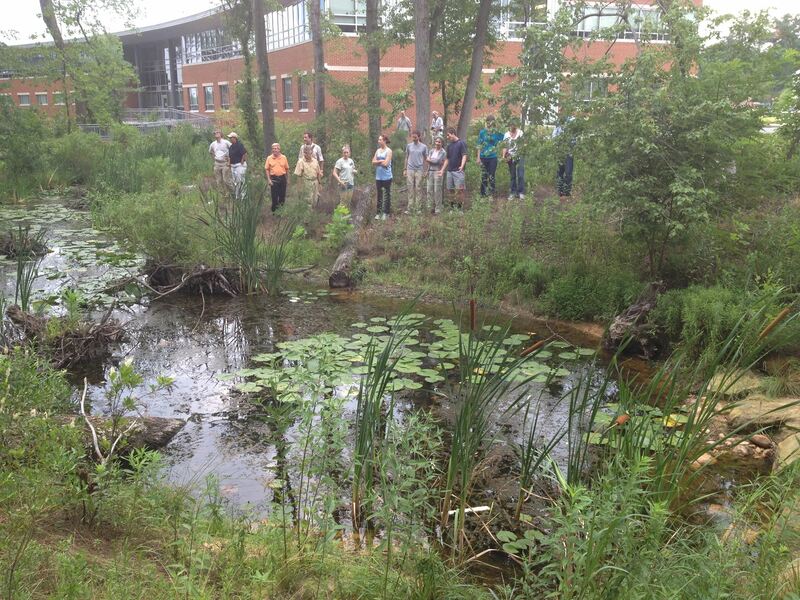 Our summer field trip was to a regenerative stormwater conveyance systme in Savage, MD designed by Keith Underwood. Happy hour followed at Ram's Head Roadhouse in Crownsville, MD. 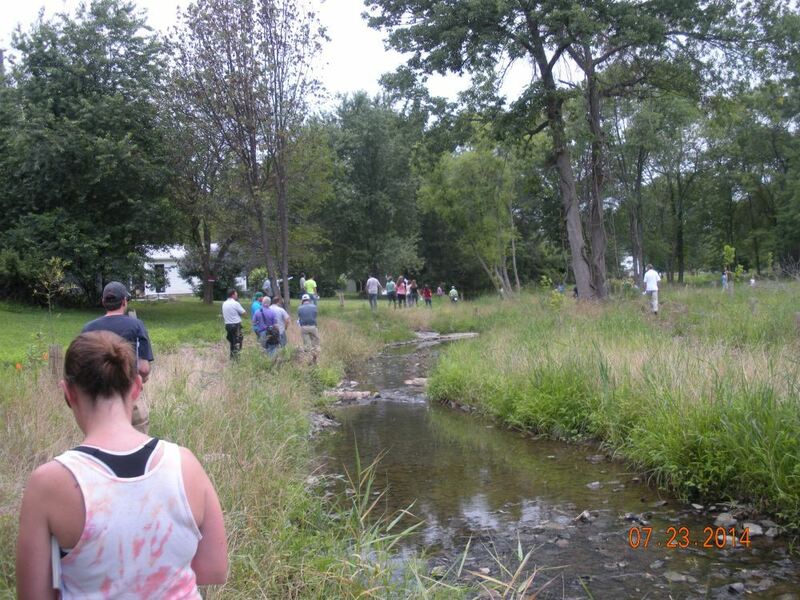 Our Summer Field Walk on July 17, 2013 was a success with 34 participants. We visited the North Branch of Cypress Creek Stream Restoration Site which was sponsored by Anne Arundel County and featured wetland creation, regenerative stormwater conveyances, and braided channels in the coastal plain. Rocky Powell from Clearcreek Consulting, Sepehr Baharlou from BayLand, and Keith Underwood from Underwood & Associates gave a tour of the site. The group gathered at Bill Bateman’s for food and drinks afterward. 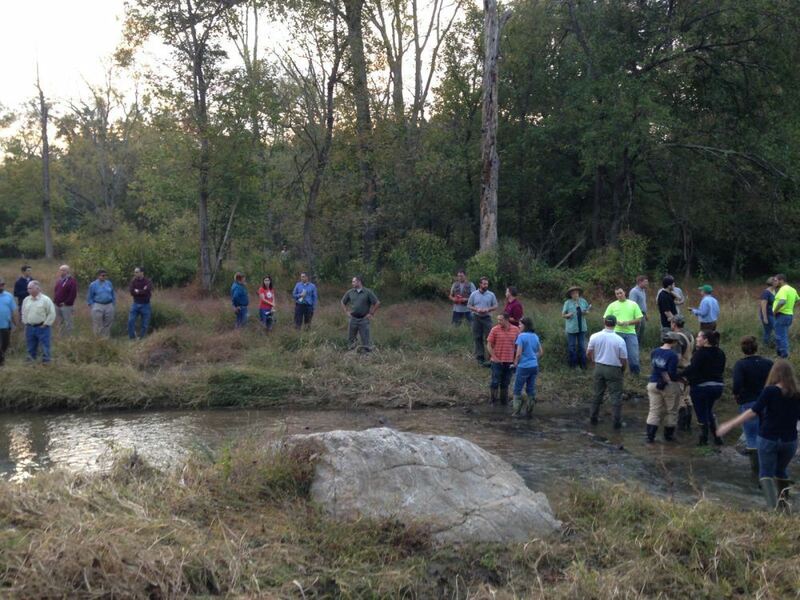 Thanks to Ecotone for hosting the Maryland Stream Restoration Association’s Fall Field Trip on October 11, 2012. 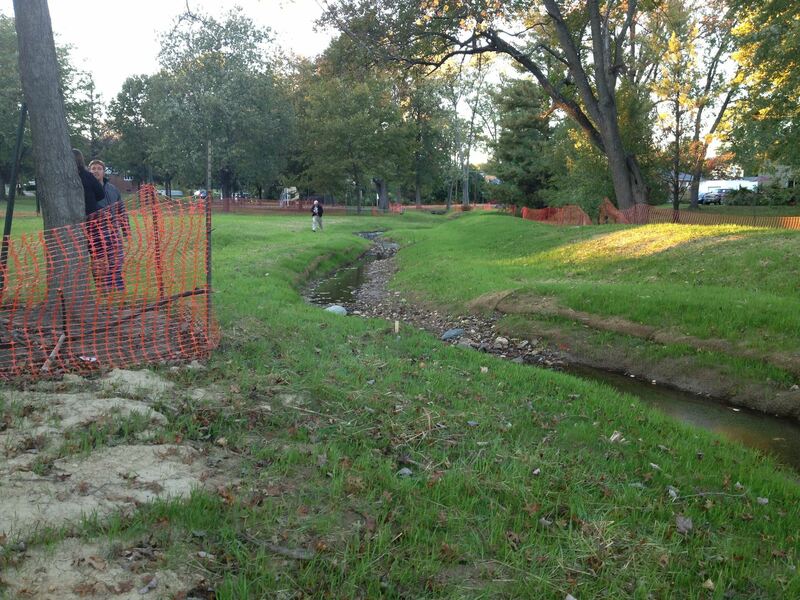 The Plumtree Headwaters Restoration project, a NFWF funded daylighting project in downtown Bel Air was visited. Following the field visit, everyone gathered at Ecotone’s new office for beer, pizza, and a bonfire. The spring MSRA general membership meeting was held on April 19, 2012 at 5:30 at the Silver Spring Mining Company in Hunt Valley at 11100 York Road, Cockeysville, MD. Jim Gracie and Scott Lowe presented two approaches to measuring sediment transport. The meeting also included elections for Secretary and President Elect of MSRA. The summer field trip consisted of a tour of the Northwest Branch of the Anacostia Ecosystem Restoration project on July 20, 2011. Happy hour followed at The Olney Tavern. 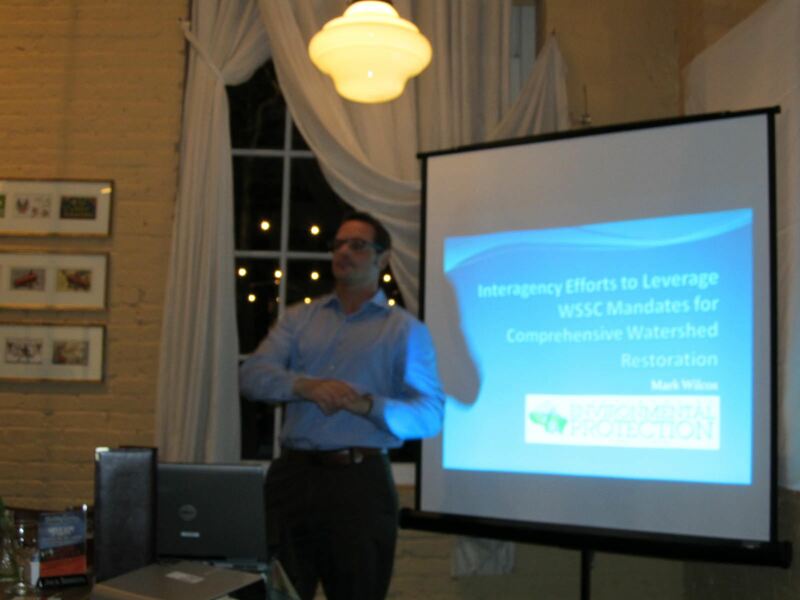 The presentation discussed completed and ongoing cooperative efforts, to meet EPA Consent Decree Requirements between Montgomery County DEP’s Watershed Restoration Group and the Washington Suburban Sanitary Commission.